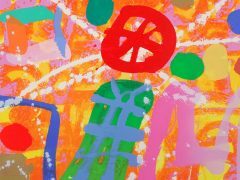 Albert Irvin, teacher, painter and printmaker, born in London. He attended the Northampton School of Art but had to cut short his studies when he joined the Royal Air Force in 1941 to serve as a navigator in World War II. After the war in 1946, Irvin enrolled at Goldsmiths College in London. He graduated four years later with a National Diploma in Design. Irvin went back to Goldsmiths, as a teacher, in 1962 and remained there for over twenty years. Throughout the 1950s Irvin developed his unique style of literal meaning through his painting. In his early career he battled with the two alternatives of abstraction and figuration. It was not until the mid-1950s that Irvin finally moved away from relying on figures and social realism in his work and embraced an approach closer to the abstract. Irvin’s reputation began to grow in the art world and he was invited to display his work at more and more exhibitions in both Britain and abroad. A new freedom to experiment also found its way into over his work as he ‘played’ with canvas size, colour, structure, shape, and composition. From the 1970’s onwards, he began to experiment with the medium of his art. 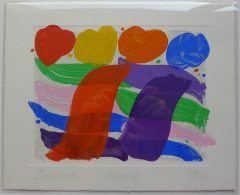 He changed from oil to acrylic and had a short-lived foray into lithography in 1975. He then began a screen printing career in 1980 with Advanced Graphics London. 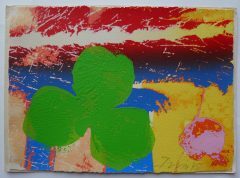 The collaborative approach of screen printing allowed Irvin to display many of his characteristic traits as an artist. He would quickly affirm his reputation as one of Britain’s foremost printmakers. The Estate is represented by Gimpel Fils, London and Advanced Graphics London.